ou made the right choice. Geniune Streeter Super Stands "Fatty" Big Foot stands. The original, top selling and best built! 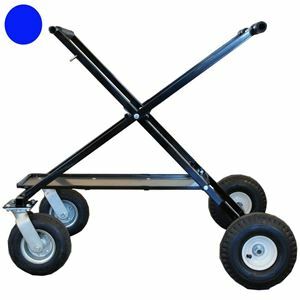 8” casters are great for rougher terrain. Large 10" rear wheels. Standard black, red, blue powder coat finish available. Built in-house at our family owner shop in Hartford, WI USA. The FATTY has the same dimensions and stance as our standard Big Foot, though is built with 1 1/4" tubing- making this one stout stand. Perfect for heavier karts like TaG, Shifters and those many Junior level karts with an abundance of lead. You want the Monster Truck of kart stands? The Streeter Super Stands Fatty Big Foot is it!